Coastal erosion is a common-enough occurrence in Britain – from the windswept Holderness coastline, north of the Humber, to the wild rugged cliffs of Cornwall; yet, it never fails to generate unease, an unsettled feeling of dread that sometimes haunts our dreams. 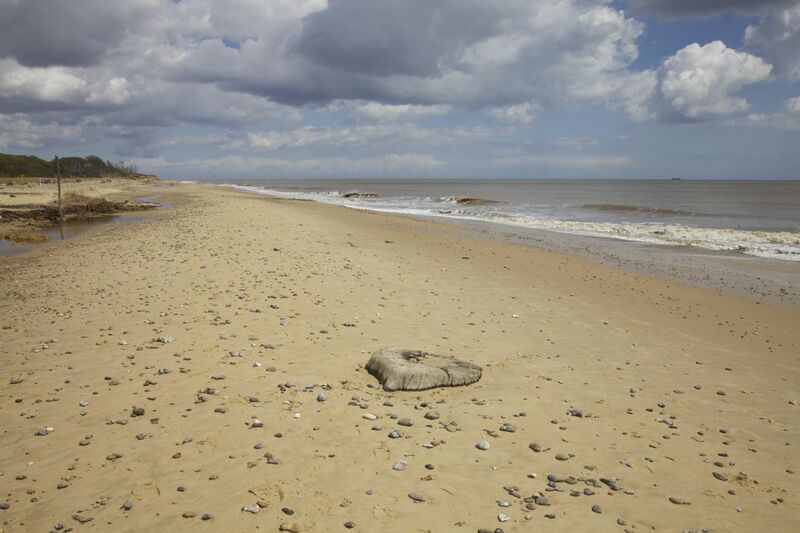 Some of my childhood dreams of being trapped on the beach by an onrushing sea were probably rooted in frequent visits I made then to the Suffolk coastline, near to where my grandparents lived. Guided by my father, I heard stories of Dunwich – the once-great medieval town now mostly buried beneath the sea – or the weird world of Orford Ness – a great shingle spit constantly being remade by the sea. Most evocative to me was the isolated coastline north of Southwold. 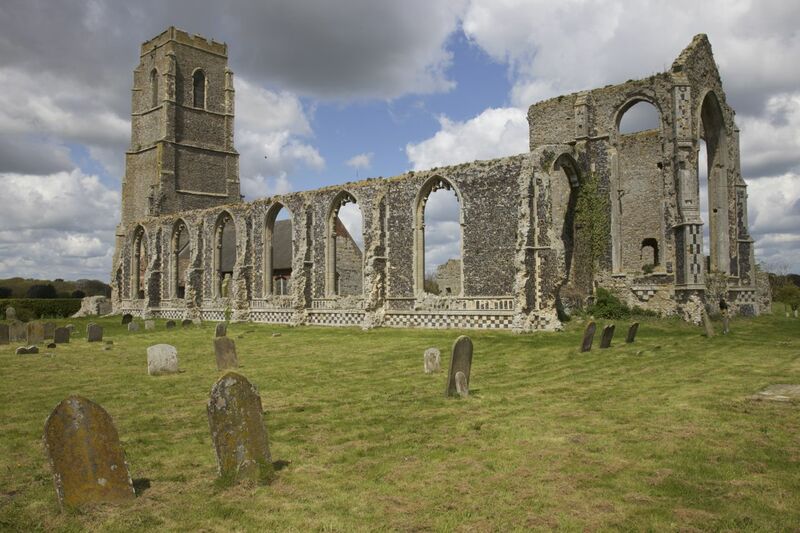 At Covehithe, the ruins of St Andrew’s church (1) stand just one field away from the crumbling cliffs, the original 100-ft tower now the outgrown focal-point of a much smaller church building. Like many churches in Suffolk, St Andrew’s was outsized in relation to the size of the community it served – never more than 300 people. The villagers themselves pulled down most of the building in 1672 leaving the tower surrounded by ruins. Walking along the crumbling mud cliffs a stone’s throw from the church, one cannot help but re-imagine its history as a product of the unstoppable power of the sea. For, over many hundreds of years, this coast has been gradually eaten away: the only road terminates right at the cliff edge (on one childhood visit I remembered seeing a car that had careered over it); the footpath often disappears into the void; and trees are visibly tumbling over the edge. It’s these trees that form a kind of mirror image of the ruined church, that is, of survival amongst ruin. 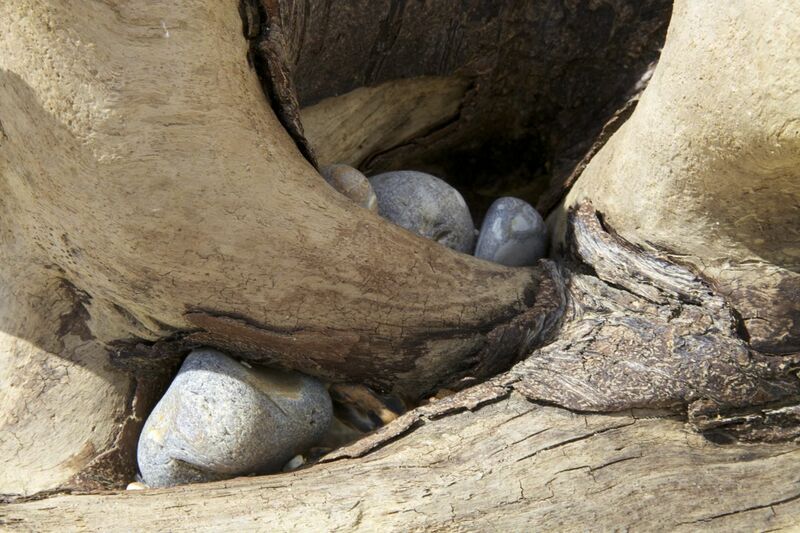 On the beach a group of trunks are arranged in a spectacular display of the effects of the meeting of wood and water. 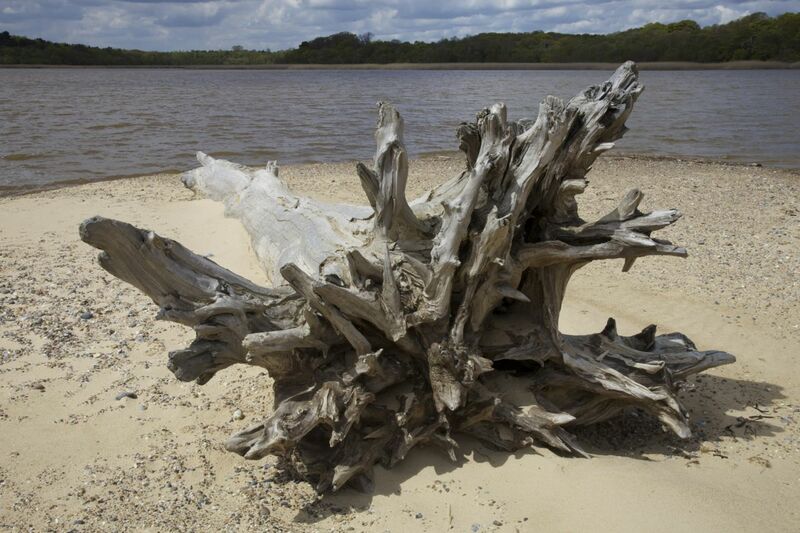 In some, exposed roots have been transformed into explosions of weird spikes – like strange, petrified sea creatures (2); in others, the roots seem to emerge from the sand as the new growth of some unknown plant (3). Some trees stand almost complete, their angular forms offering a kind of melancholy testimony to their stubborn refusal to decay (4); others lie prostrate, gradually sinking into the sand world beneath them (5). Some cradle pebbles, stuck fast in between sea-smoothed branches (6); others, in a much more advanced state of ruin, barely register, mistaken for stones on the shoreline (7). These trees offer tangible visible evidence of what happens to supposedly solid objects in these coastal edgelands. Contrary to what we imagine, these places are not really edges at all; rather, they are the meeting points of two different worlds, ones that we generally hold to be entirely separate. For us to remain solid and rooted, that other world of ceaseless flux must be kept at bay. In reality, however, this notion of solidity is an illusion; for everything is always moving, from the smallest subatomic particle to the largest galaxy. It’s precisely that movement which is constantly producing new and unexpected forms – the beauty of which is displayed in those sea-blasted trees. See our JR Claim on our website in the next day or two. It’s the last chance we have now to save anything of London Bridge station’s railway heritage. Thanks Russell. Will look at the website. …the meeting points of two different worlds…everything is always moving…Great post and images but especially love this part of it. Thanks for this. Written on the hoof really. I found the trees quite extraordinary – because of the sea they’d turned into something else entirely. Thanks Lesley. Made easier by fabulous clear light. Just found your site and much to look at. 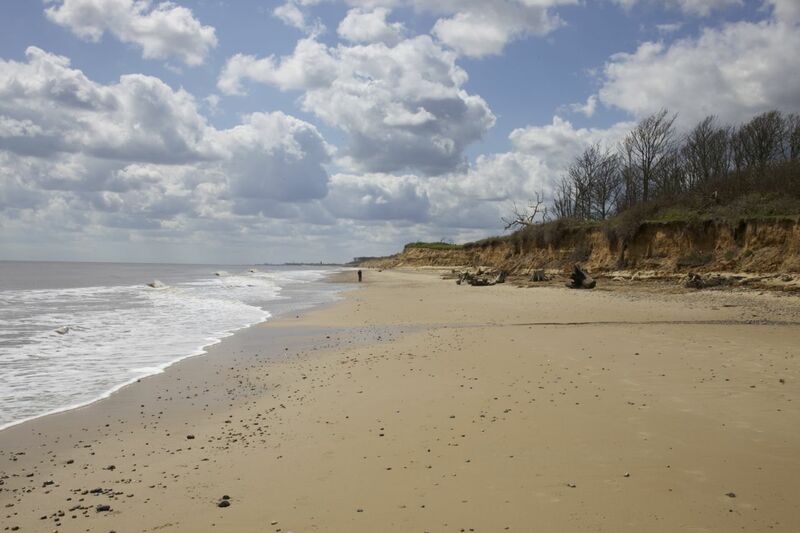 Great pictures and good to hear about Covehithe and Dunwich. I am especially interested in this as I have written a guide to walking the Suffolk Coast for Cicerone. 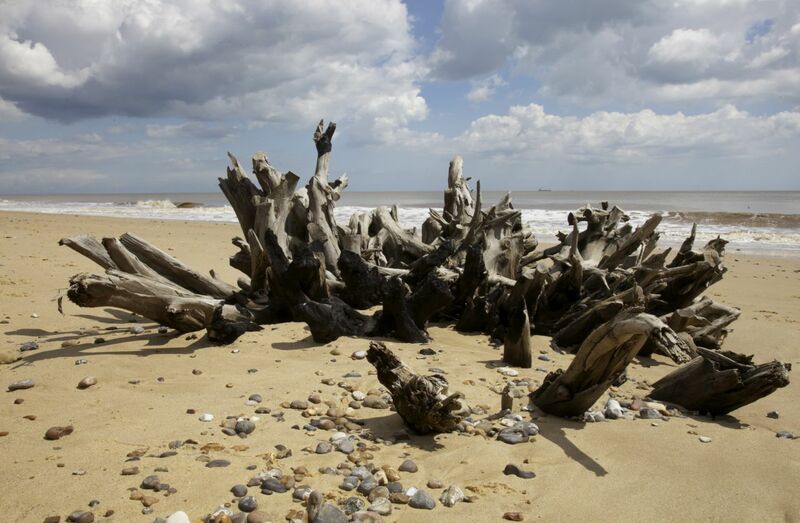 Here’s a taster here (with more Covehithe and Dunwich images): http://eastofelveden.wordpress.com/2012/02/15/suffolk-coast-walks/. 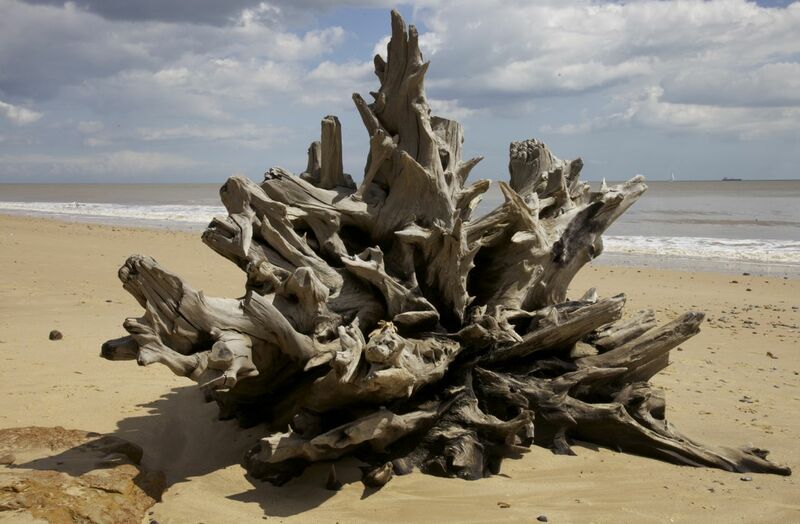 Also, for more amazing weathered tree stumps and the like, try further south along the same coast between Shingle Street and Bawdsey – an amazingly neglected bit of coast (although admittedly it is a bit hard to get to). Thanks so much for your comment. I’ll certainly have a look at your walking guide (I’ve used Cicerone mainly for mountains). 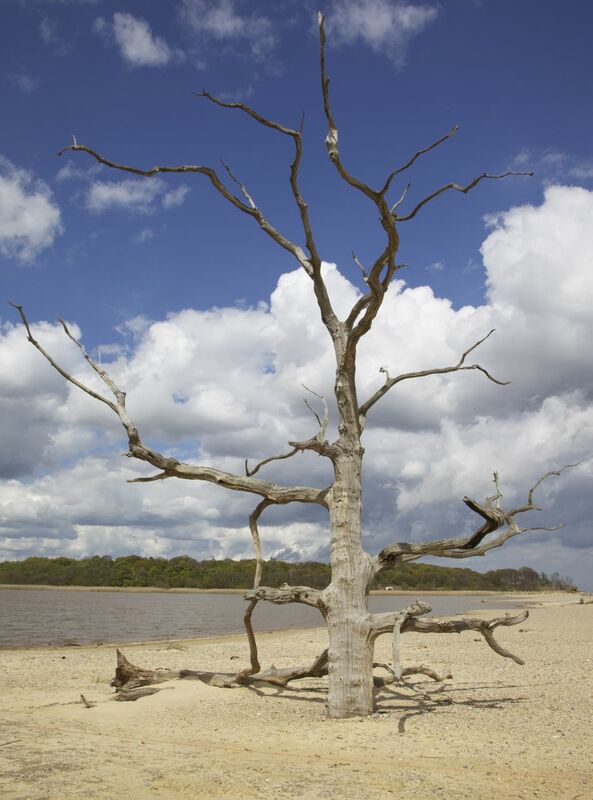 I didn’t know the Shingle Street stretch also had some more weathered trees – next time! I’m sure you’ve read W G Sebald’s The Rings of Saturn (about his walk through Suffolk) – you should see the film as well (Patience: after Sebald). Yes, of course, have read the book and seen the film. I live in Norwich where Sebald used to teach at the university before his tragic death.